You can now pre-order The Boxee Box on Amazon , which instantly turns your TV into a full featured media center. Pre-ordering on Amazon comes at 13% discount from the $229 retail price, at $199.99. According to Boxee, those who pre-order on Amazon will receive the Boxee Box before it goes on sale elsewhere later in the year. Pre-ordering The Boxee Box now on Amazon guarantees that you will be the first to receive the device when it is expected to ship this November. It’s certainly a hotly anticipated device, despite it only being available for pre-orders since yesterday it has already made it into the top 10 list of best selling electronics on Amazon. 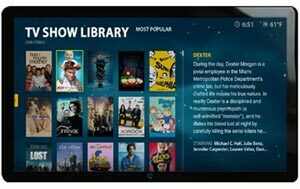 The Boxee Box, new Apple TV, Roku, and others are part of an ongoing TV revolution, which aim to bring the world of online media distribution and consumption to your living room. If you happen to have a Mac Mini, turning it into a media center is also a great option. No, not sponsored. We have covered Apple TV and Mac media centers on multiple occasions and Boxee Box looks to be a genuinely worthy competitor in the niche. It is worth checking out even if you have no interest in obtaining the hardware. If a sale of the hardware is made via the Amazon link we do get a small commission through the Amazon partner program. And it’ll let you stream/watch HD YouTube videos since the interface is based on Mozilla/Firefox. My WDTV Live HD can’t do that. I will buy it but I guess I have to wait for a while — I’m in Stockholm, Sweden.